User Tracker Count: 161 times. This belongs at Seaworld. Enough said. Its a descent show i like animals a lot so it grabbed my attention at parts. i got a front row seat which upped the expierience for me. They had dogs and a reticulated python and a hawk or eagle or something. Much rather would be riding rides then watching this show or any show really but i review as a show only not compared to any rides or anything and give a rating of 7. This show was no better than average for me. The animals did not perform very many stunts and it seemed most of the show was on the big screen above center stage. The monkey that could do flips on the trapeze was the only thing memorable. The jokes are not even funny to the children that they are intended for. As good as universal studios is and as big a name as animal planet is, I expected much more. I have seen quite a few animal shows in my life, but when I saw the words "Animal Planet" attached to the name, I was really expecting something fantastic, the best ever maybe, or at least on the level of some of the shows I saw at Sea World SD. However, though I missed the first five minutes, it wasnt as good as expected. papa was right on in saying that they used too much video. This was a live show guys... the choice of animals could have been better, we have all seen a guy in the park with a constrictor before, but the birds were cool as was the orangutan, but I just wish that it was a bit better. Audience interaction was cool, but that didnt make it awesome and this show is just mediocre at best, which is a real bummer. I liked this. I loved how the parrot stole an audience members money and gave it back to him. All the other animals were also well-trained. A major disappointment, this show does nothing right. Much of the show is taken up with video clips from Animal Planet. If I wanted to watch TV I could have stayed home. The animal acts were surprisingly lame and unimaginative. Noone in my party of 7 (all of whom like Animal Planet) enjoyed this show. 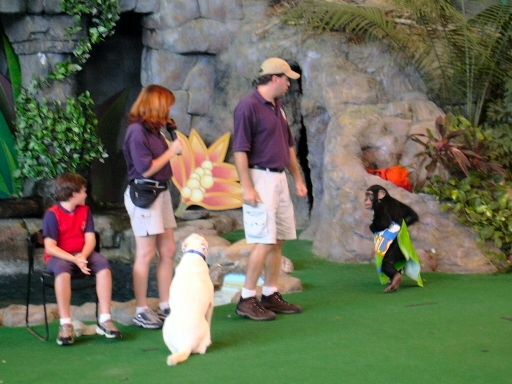 The dog show at Sea World was a hundred times better. A very bad show, Im soory to say it but this is a bad show. This show features very few taletned animals and is way over hyped. Also way to much of the show is watching video of Animal Planet. I dont get why we should have to watch video of Animal Planet at this show. Isnt that we have, or why we dont have (lol) cable at home? The animal show at SeaWrold is far better. A cute animal act which serves it purpose of entertaining masses of people. On the day we went we witnessed a funny agility competition between an athletic Austrailian Shepherd dog and a goofy Pug complete with audience participation and the Pug giving the volunteer a wet suprise. A smart-mouth Orangatang, a Maccau Parrot and Falcon performing some very low fly-bys over the crowd...buzzing heads by inches, and a Quaker-Keet bird shuttling dollar bills from a lady in the crowd to the trainer and back again. The show could have been a little longer but I was amused nonetheless. not bad, no complaints except...WHERE WERE THE CATS?? i guess theyre only fit to work in the control room..not as performers eh? sounds like some kind of anti-cat bias to me. I enjoyed seeing all of the animals running around doing tricks and stuff. It was cool. If you are an animal fan make sure you stop in and see this show.